Papo & Yo creator Minority Media has announced the launch of its newest “empathy” game, Spirits of Spring. 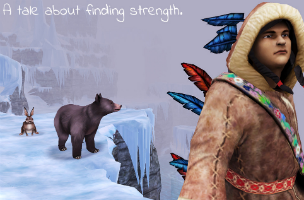 In the game, players follow a teenager named Chiwatin, along with his talking animal friends Bear and Rabbit, on a journey to free the world from a permanent winter using Chiwatin’s control of spirits, small colorful orbs that trail along behind him. Along the way, Chiwatin is bullied by a group of crows, and must learn a powerful life lesson on how to deal with unwanted attention. According to Minority Media co-founder, Vander Caballero, empathy games are those that “tell a personal story through a metaphor, and which are crafted to help players experience the life-changing journey of the character.” In the case of Sprits of Spring, players experience bullying firsthand as Chiwatin. The character’s movement sees him legitimately stumbling frequently while running, a fact that is picked on by the crows. The bullying becomes worse as players progress through the experience, leaving Chiwatin to make some impactful choices on how to deal with his tormenters. For instance, does he lower himself to their level to fight back, or does he take the high road? Actual gameplay in Spirits of Spring is split into three chapters, with multiple gameplay checkpoints in each. Users tap and hold on the screen to direct Chiwatin’s movements, and level progression is ultimately linear. There’s an overall theme to the gameplay, as users must collect spirits from flowers scattered throughout environments, in order to manipulate those spirits later on and open up additional pathways. Players can tap and drag a line on the spirits to send them out in front of Chiwatin, forming bridges over gaps, or collecting hard-to-reach spirits, as examples. At certain intervals, players also take control of Rabbit and Bear, who each have a different skill. Rabbit can teleport across environments using burrows in the ground, while Bear can stand the icy cold of the land’s near-frozen water, swimming to reach locations no one else can. Doing so is often required to collect additional spirits, which Chiwatin (or another character) then uses to open up the path to progress in the story. Spirits of Spring is available to download for $4.99 on the iTunes App Store. It should be noted the game contains a rare issue on iPhone when swiping to swap between playable characters, or when sending sprits to remove obstacles in the environment. These prompts sometimes fails to react without an incredibly precise motion, so players must swipe multiple times to progress. According to the team, this isn’t a break in the game, but is rather a product of playing the game on a smaller screen.